Ask any communications practitioner what the measure of success is for their campaigns, and most often the response will be a list of well written coverage pieces, shared aggressively across social channels. Ask any marketer what the measure of success is for their campaigns, and they will reply with a litany of metrics. Guess what, social media pros — you’ve been doing it wrong. It is time to measure like a marketer. Before launching a measurement program, the first thing you must do is clearly define the goals of your program. These goals are specific to your company based on your company’s product offering, sales cycle, customer journey and of course, C-suite plans. While your goals may vary in your industry, common goals are related to increasing awareness, aiding in research and consideration, encouraging actions, identifying and generating advocacy from new and existing brand fans, and driving repeat business through loyalty. Next, you need to determine your audiences for each goal, and define not only what activates them, but what platforms they use that puts your company’s information directly in front of them at the time they are most likely to act. If your goal is both increasing sales while encouraging a merger, you will need to look at activating both customers and potential financial buyers, both who look for and consume very different types of company information. Now that you have your goals and you understand who your audiences are, it is time to build your customer journey. This is a map that outlines the journey a potential customer would take to discover and buy your product. Once you know what journey they take, you can determine who influences them, and what questions they need answered before they will consider your company or company’s product. Once your goals are set, it is time to determine your social media strategies outlining activation programming customized by both platform and audience demographic. Consider a micro-messaging strategy in which you create and share messaging and content that is highly personalized for each individual demographic you are trying to reach. Now is the fun part of your program, determining your communication programming and your content creation and distribution strategy. The broader you can distribute your news or branded content within your target audience’s sphere of influence, the higher the results will be. So keep in mind, your program will need to be a mix of relevant brand content and a smart news amplification program such as newswire distribution and social amplification of coverage. Once you have identified the above, it is time to establish your baselines so you can start tracking your success. While there are many parts of your program that are important, it is key to ensure your measurement program ladders back up to your company’s goals. For example, it may not be possible to drive a sale with a tweet, but you can track and count smaller actions that are moving your prospects through your marketing funnel. Per Nielsen, editorial coverage continues to be the most trusted content a company can generate to move people through their sales funnel. Trying to support company sales? Track mentions and coverage in industry publications read by your customer type. Supporting a merger? Monitoring discussions within financial circles will be required. Regardless of the publication coverage you are sharing, brand mentions and overall visibility should be tracked. What social media share of voice to you have in your industry – are most updates about you or your competitors? Did your message come across clearly? Did the article say what you wanted it to say? Was it shared by readers? How did they react? The same study that noted that editorial coverage was highly trusted by 67% of purchasers noted that this trust jumps to 84% when the news is shared by a 3rd party, so you must not only generate social discussions, but track their impact such as link clicks using URL trackers like Click to Tweet, Bit.ly and UR builders. To further increase advocacy, try Click to Tweet. Click to Tweet is a terrific free service that allows you to pre-write and place a tweet within your published content to encourage readers to share your information out across their social network. Click to Tweet is an easy and tracked way to increase advocacy and reach of your information. Sites like Bit.ly shorten your URLs and then provide you metrics on the number of clicks each URL received, which is perfect for measuring action. URL builders are appended links you can easily generate at no charge from your website analytics program that track the amount of traffic you drove to your website. Please note that not all traffic will come in via an appended link so use these metrics as a snapshot to tell you the following: How many people came to the site, if it is their first or fifth time visiting, if your landing page is helping covert visitors into purchasers or if it needs to be updated and more. URL builders are KEY to any measurement program moving forward. One of the biggest issues any communicator today deals with is message truncation across social channels. Smart companies will track message variations and make corrections via blogs or social updates to ensure the true intent of the content is heard. One of the best measures for today’s communications programming is demystification. Is your messaging taking the mystery out of your product, making it easier and clearer for readers to act? Are you reducing calls to your customer service teams? Are you replacing time spent on the phone with online education? Take the time to determine what the most time consuming issues your teams face each day and use the communication channels at your fingertips to track the programming that reduces these costs. Every time you launch a communications program, you are launching a new way for interested parties to connect with your business. Don’t forget to count new subscriptions to your email marketing programs and social channels in your metrics. Thanks to your efforts, you’re shortening your sales cycles by moving people into direct marketing channels. As I noted earlier in the article, the real “trick” to successful communications programming is not only a strong understanding of your goals, and good content, it is all about the content amplification. The more you promote your news and content, the more activities it will generate. Newswire services like Business Wire amplify content such as breaking news, white paper launches and more — increasing the opportunity for company information to be discovered, covered and shared. Build good content, amplify it and measure it’s impact and you’ll find it easier to not only meet your communication goals, but exceed them. Serena Ehrlich is the Director of Social and Evolving Media at Business Wire. Ehrlich was named one of the 2013 Top 25 Women in Mobile to Watch by Mobile Marketer. Follow her on Twitter @Serena. All marketing is communication, but not all communication is marketing. Marketers believe otherwise (the reverse, in fact.) When selling stuff is the only thing you measure, it becomes the only thing you do. Bless you Dr. Macnamara. 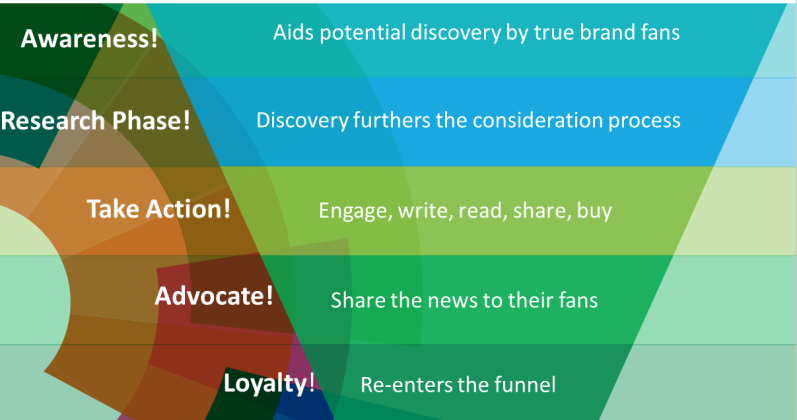 This is a useful article for marketing PR and marketers using social media. But there is a fundamental problem with this as a general article about social media – a problem which is evident in much discussion. Every piece of advice in this article presupposes that social media are used by companies; that they are used for sales; and that those addressed are merely ‘consumers’ to be driven through the “sales funnel” of corporations selling products and services. By all means, provide advice such as contained in this article, but accurately contextualize it as applying to companies, marketing, and sales. This is important, not merely pedantic or semantic, for two reasons. (1) In many countries government is one of the largest employers of communication and PR practitioners. Also, NGOs and non-profits need communication, including social media communication. Government, NGOs and non-profits are not in the business of driving people through sales funnels. Governments in many democratic countries are looking to engage and re-engage citizens, gain insights into public opinion, consult, and foster dialogue. Social media and so-called e-democracy are important avenues to reinvigorate democracy and civil society in countries in which citizens are increasingly disengaged, including the US. (2) This leads to a second key point – the unique characteristic of social media compared with traditional media, and the underlying reason for their popularity, is that they are (or are meant to be) ‘social’ – they are two-way channels; they afford conversations and allow people to speak and have a say. Focussing on and using social media for largely one-way sales and marketing is only one use of social media – and a potentially counter-productive one in the long term. If social media are used only to “distribute your news”, to “moving people through the sales funnel”, and for “tricks” designed to sell, that’s not ‘communication’ and it will likely lead to the same backlash that has befallen TV commercials and other forms of ‘push’ sales and marketing communication. Please, authors and IPR, there is a whole world out there beyond business and a lot more to communication than sales.